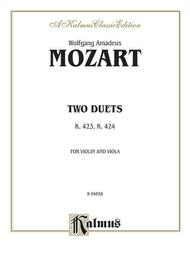 Two Duets, K. 423, K. 424 composed by Wolfgang Amadeus Mozart (1756-1791). Duet or Duo; Masterworks; String Duo - Violin and Viola. Kalmus Edition. Classical; Masterwork. Book. 28 pages. Published by Kalmus Classic Edition (AP.K04658).ISBN 0757978479. Classical; Masterwork.